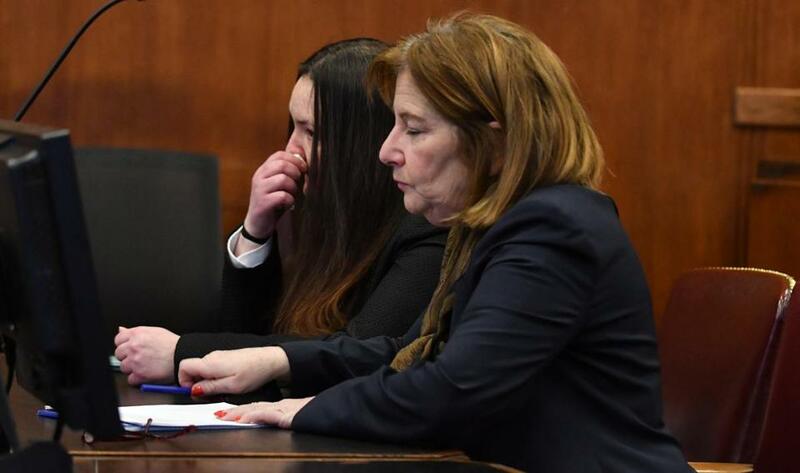 Rachelle Bond (left) and her attorney, Janice Bassil, reacted during the hearing in Suffolk Superior Court where Bond plead guilty to being an accessory after the fact to the murder of her 2-year-old daughter. Rachelle Bond was expressionless as she rose in Suffolk Superior Court on Friday and admitted to watching her boyfriend murder her 3-year-old daughter Bella, then helping him throw the little girl’s body into Boston Harbor and cover up the crime. “Uh, guilty,” she said in a quiet voice. Her only display of emotion came moments later, when Assistant District Attorney David Deakin described for the court the night of the alleged killing, when Bond saw Bella’s gray and swollen face and realized the girl was dead. As he spoke, Bond’s face crumpled, hidden behind her long hair. Under the terms of the plea agreement filed Friday, Bond, 41, pleaded guilty to being an accessory after the fact of murder, and to larceny over $250 by false purposes, for collecting her daughter’s state benefits after she died. She will be credited with time served, and placed on two years of probation. She has been incarcerated since Sept. 18, 2015. The deal requires that Bond testify in the murder trial of her former boyfriend, Michael McCarthy, who is charged with killing Bella. Bond will remain behind bars until after the trial, when she will be sentenced. McCarthy’s trial is expected this spring. He has pleaded not guilty, and is being held without bail. “My client, from the moment I met her, has wanted nothing more than to see Michael McCarthy convicted for the murder of her daughter,” said Bond’s attorney, Janice Bassil, who said she saw Bond as “a victim” in the case. But McCarthy’s attorney, Jonathan Shapiro, said the plea was a slap on the wrist for Bond. The only person who claims McCarthy murdered Bella is Bond, he said. But Shapiro said McCarthy did not kill the girl, and did not even realize she was dead, because Bond told him she was in state custody. Bella was killed one night in May or June of 2015, after McCarthy offered to put her to bed in the Dorchester apartment the three shared, Deakin said. After a period of silence, Bond walked into the bedroom and saw McCarthy standing over the girl, “moving his arms quickly in the area of the girl’s midsection,” Deakin said. Bella, who loved Hello Kitty and dressing up like a princess, was dead. McCarthy put the girl’s body in a garbage bag and into the refrigerator, prosecutors have said. He told Bond that he would kill her if she reported the child’s death, Deakin said. After a few days, McCarthy forced Bond to go with him to South Boston, where he threw the girl’s body, wrapped in the trash bag and a duffel bag and weighted down with barbells, into the harbor, Deakin said. Bella washed up on Deer Island about three weeks later, on June 24, but officials could not identify her. She became known as “Baby Doe,” and a composite image of her chubby cheeked and smiling face traveled around the world in an international investigation that had detectives tracking down leads as far away as India and Brazil. But Bond never confessed her secret. After her daughter’s death, she and McCarthy remained living together, using drugs and walking McCarthy’s dog, Deakin said. Though Bond left the apartment alone, including a trip to housing court where she spoke with a lawyer, she told investigators that she feared McCarthy and what would happen if she revealed the truth. Bond also lied to several people about Bella’s whereabouts, Deakin said, saying the girl was living with her sister, staying with her godparents, or spending the summer with her father, whom Bella had never even met. In a recertification form for housing subsidy benefits filed after Bella died, Bond claimed the girl was still alive. She also continued to receive $1,364 in state benefits for the girl, including a $200 clothing benefit. In mid-September, Bond told a friend of Bella’s murder, and the friend told the police. Though Bond initially fled detectives who showed up at her house, she later spoke with them and has cooperated since, officials have said. During the plea, Bond spoke clearly, responding to the judge with “yes, ma’am,” and “no, ma’am,” as Sanders walked her through her rights. She never looked at the media or detectives in the courtroom. Bassil said Bond had suffered losing her child, and then been threatened by McCarthy and prevented from doing the right thing. Bassil grew irritated by questions from reporters about how she could consider her client a victim when Bond helped dispose of her daughter’s body and then stayed silent.“Why don’t you walk in her shoes for a week and see how well you do?” she asked. Thomas Farragher: Baby Bella was right here. How did that happen? Evan Allen can be reached at evan-.allen@globe.com.